Angles are important. They give us new perspective on old outlooks. They give us clarity and definition. They give us creative empowerment to move forward in a different direction. 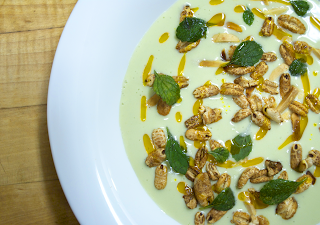 ...Chilled Cucumber and Almond Soup with Puffed Barley. If you squint your eyes. The addition of fresh lemon balm and chili oil make the angle just off kilter enough that it's not an obvious deviation from the original.